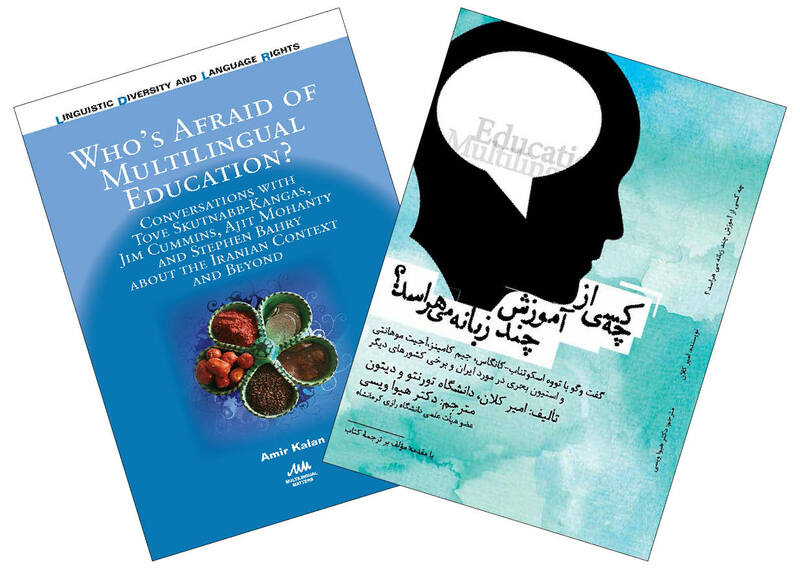 An open access Farsi translation of our 2016 book Who’s Afraid of Multilingual Education? by Amir Kalan was recently made available. In this post the author explains why the publication of this translation is so important. Although English academic writing has facilitated communication between scholars from different parts of the world, it has at the same time contributed to complex forms of academic imperialism, which harmfully interferes with knowledge creation and dissemination in languages other than English. In 2016, I published a book with Multilingual Matters about dominant discourses regarding mother tongue-based multilingual education in the Iranian context. The book, entitled Who’s Afraid of Multilingual Education?, was written based on interviews with influential scholars of multilingual education and language rights in order to contribute ideas to the mother tongue education debate in Iran. The open access publication of the Farsi translation of the book recently became possible thanks to Multilingual Matters – who provided the copyright – and University of Dayton – who published the ebook. In this blog post, I briefly write about the significance of the publication of the translation of the book. Academic publishing in English has created a global community of scholars who share thoughts and experiences about a wide range of topics including global issues that occur outside the English speaking world. Academics working in the Anglo-American world write about other people’s cultural practices, languages, literature, art, and education. Western scholars even write the histories of non-western populations in English, the de facto academic lingua franca. On the other hand, non-English speaking international researchers are also pressured to publish in English for promotion, a trend encouraged by university ranking dynamics. This trend, on the bright side, has been a blessing in that we become aware of issues and conversations in many parts of the world. There is, however, a darker side to this status. The journal industry and academic publishing apparatus are practically at the service of promoting a commercialized higher education, which uses researchers’ work for marketing purposes as well as knowledge dissemination. Academics’ publications in this sense become the window of the higher education marketplace in the West for potential shoppers. This approach has serious consequences for knowledge creation and consumption. Most accessible knowledge today is packaged in English, which has practically made non-English academic texts be perceived as less reliable. Also, university libraries have become the main customers of publishers because the books are sold at high prices, alienating public audiences – including non-English speaking populations. For researchers, this means investing their lives into books and papers that would only be read by a small number of readers, or even not read at all. At the same time, academics are pressured to publish more and more, resulting in a focus on quantity and repetition rather than quality and originality. When it comes to international scholars the situation is even worse. International scholars whose research focuses on local contexts beyond the English speaking world are typically required by their institutions to publish in English. International scholars have to write in a language other than their mother tongue and compete with English speaking scholars who are often already connected with the English academic publishing and journal industry. Just as problematically, international researchers’ work often involves local issues, but because their findings are published in English, local populations have almost no access to the results of the research that was conducted for studying their cultures. This phenomenon raises serious epistemological questions about knowledge dissemination and the positionality of researchers as well as significant conversations about ethics of academic publishing. The Farsi translation of Who’s Afraid of Multilingual Education? bent this model in favour of the population that the book was written about and, to a large degree, written for: Iranian educators. With the situation of mother tongue-based multilingual education in Iran in the background, the book brought together prominent scholars of language policy and linguistic rights in different parts of the world to respond to the doubts and questions of Iranian educators and ethnic mother tongue activists. Although the outcome of this conversation was an analysis of sociopolitical discourses that are meant to undermine the role of minoritized languages all over the world, the catalyst of our conversations was the challenges minoritized students are facing in today’s Iran. Thus, one ideal audience among others for this book would naturally be Iranian teachers eager to learn about effective policies and practices in other parts of the world. Nevertheless, the academic publishing industry has not been designed for interaction with native populations. Iranian language teachers – especially those in disadvantaged provinces where minority languages are suppressed – would never be able to afford the English book. In some cases the price of one copy of the book would equal an Iranian teacher’s monthly income. Even if an enthusiastic teacher decided to make such an investment, he or she still would have no access to the book. A combination of western sanctions and the Iranian government’s strict censorship policies has practically made the distribution of the book in Iran impossible. Most foreign publishers have no active presence in Iran; online retailers such as Amazon do not provide service in Iran; and western credit card companies have no reach within the country and its banking system, which makes online shopping impossible. In these circumstances, the educators who practically own the conversation which the English book presents have no access to the text written about their lives. The English version of Who’s Afraid of Multilingual Education? was not funded in any form. The book was not connected to the participating scholars’ sponsored research. The publication was the fruit of personal commitment and interest of researchers who deeply cared about minoritized students. The translator of the book similarly decided to pen the Farsi version out of personal passion without our knowledge. He had finished the translation months before he contacted me to share news about his work. When I approached Multilingual Matters and the University of Dayton about the possibility of open access publication of the book and highlighted the fact that such a move could break the current mode of elite academic publishing, they did not hesitate to support the free online publication of the Farsi version and worked hard to guarantee the high quality of the publication. Multilingual Matters generously provided the translator with the rights to the Farsi version and offered moral support. The manager of University of Dayton’s E-scholarship also worked hard to release the book in the best possible format as soon as possible. I am grateful to Multilingual Matters and University of Dayton for supporting the open access publication of the translation of my work. Apart from my personal interest in the project, their decision, I believe, has had important ideological, sociocultural, and economic implications. The translation resists the English-only stance of mainstream academic publishing industry. It provides access to local educators who are the real owners of the book content and invites them to share their thoughts about the debate. In other words, the conversation is no longer about them but with them. Additionally, the free online distribution of the book creates access for native teachers who are often financially disadvantaged. It is fair to see this experience as an example of how we can democratize the academic publishing industry and perhaps remedy some of the effects of the current academic colonialism. For more information about Who’s Afraid of Multilingual Education? please see our website. You can access the Farsi translation of the book here. Who’s Afraid of Multilingual Education? I would love to be able to translate it in Urdu. Urdu language speakers face the same dilemma. Hi Tasneem, thanks for your interest in this title. If you would like to discuss this, please send us an email at info@multilingual-matters.com.